Norway in a Nutshell is a website where you can purchase tickets to see the majestic and spectacular Fjords of Norway. It was one of the highlights of my month-long trip in Europe and I was joined by the three Tour participants I was leading through Scandinavia. We began the day early, leaving our hotel in Oslo, Norway at 5:30am to walk to the train station for the start of our adventure. I briefed everyone the day before as to the timeline of events and what to expect. It would be a long day…15 hours, beginning with a five-hour train ride to the town of Flam where we would board a one hour scenic train ride through the beautiful mountains, passing breathtaking waterfalls, rocky cliffs, and lush green meadows. It was voted by Lonely Planet in 2014 as the best train journey in the world. We would then board a boat for two hours of incredible beauty traveling through the Gudvangen Fjord, which is a UNESCO World Heritage Site. Next a bus would pick us up for a one hour ride to the last leg of our adventure, a 1 1-2 hr. train ride into Bergen, Norway. Surrounded by towering mountains and blessed with a perfectly sunny spring day, it was easy to feel connected to everything! It was such a beautiful trip and everything was timed like clockwork! I hope you can experience the splendor of the Norwegian Fjords through Norway in a Nutshell some day! Sognefjorden. You can’t a-fjord to miss this. Norway in a Nutshell seems pretty spectacular. The photos are wonderful. Thanks, I liked your Bergen photo too. Seems like I was just there, but it has already been more than a year ago. I’d love to do the Norway in a Nutshell tour. I remember that we checked prices some summers ago, but ended up not going..
Hope you’re able to go soon! I almost feel I was on your tour but truly wish I were in person. The photos are excellent. Just great. Thanks for sharing them with us. That’s great…thank you for viewing!! Those photos are as breathtaking as the scenery! Thanks, Sherry! Thank you so much!! Hope your weekend is great! Nice photos. Last year in May we did a 14 day cruise up the west coast of Norway, from Bergen to North Cape. We had a stop in Flaam which gave us a chance to do Norway in a Nutshell. I second your recommendation. If anybody is in the area they should make the effort to take the most scenic train ride in the world. Wow…I’ll bet that was an amazing cruise! Do you have pics on your blog? 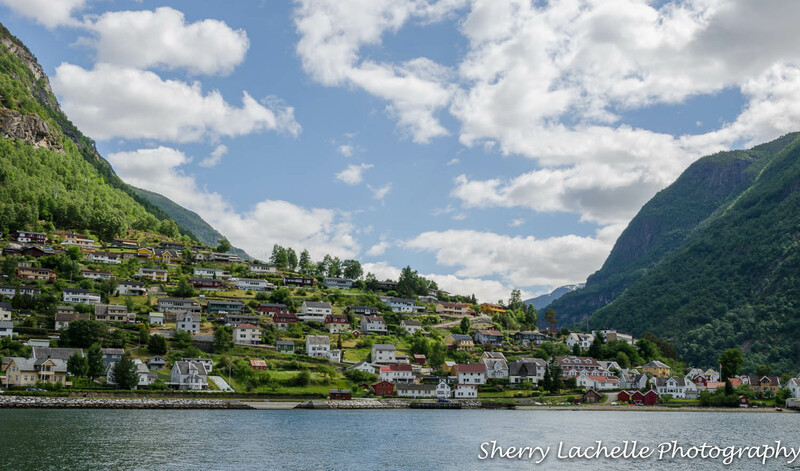 Sherry, I loved experiencing Norway through your camera lens……Amazing photographs, fascinating journey, and beautiful memories! I have added Norway in a Nutshell on my bucket list! Thanks for sharing your journey with us! You’ll love Scandinavia! Thanks for reading/viewing Sherry!! Great photos .. Looks amazing! Wow – your pix are a great incentive to go there. It was great to visit vicariously through your lens -.thanks. The boat trip reminds me a lot of going up Grenville Channel on the BC coast, but we don’t have those beautiful brightly coloured villages along the way. Great photos, Sherry. Lovely tour. I’ve been in Vancouver and took the “Sea to Sky Highway” almost to the ski area. It was beautiful. Thanks! I managed to get lost on the Norway in a Nutshell tour…I know, it is hard to explain how someone could get lost on a packaged trip like that, but I did. Great pictures. What section did you get lost on? I got on the wrong boat. Got a free island cruise because of my stupidity. Thank you Rick…coming from such an accomplished photographer, I’m flattered! I really appreciate your support! I loved seeing this part of Norway through the lens of your camera! I have so much traveling to do, and you have now added to my list of must-see places! Thank you so much Reese! I’m happy I’ve stoked your travel bug even more! !